Last night my husband went up to the garden to look for some tomatoes. What he found was a formidable sentry keeping watch. 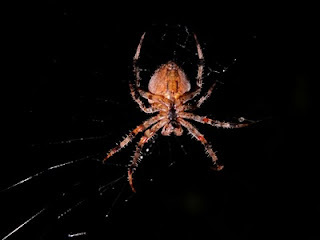 In the light of day it wasn't anywhere to be found, likely hiding in the tomatoes, but the web was something to behold! I managed to squeeze under it enough to find the one tomato hiding behind a plant. And I also grabbed a cucumber, likely the last. The peppers are having a second crop and the beans are almost ready. It won't be long before I dump all the plants over the railing, lash down the pots and cages, and rake the dirt into the yard below. I used the tomato and the cucumber, along with farm share parsley and cippolini onions, to make a tabouli salad. The only difference is I'm using half the volume of lemon juice and oil. The last time I made this it was too watery. Fortunately, with fewer greens, a lot of the vegetables, particularly the squashes, onions, and carrots, can be stored for a while. This is good because we haven't been home for dinner much in the last week or so. Last night we had steamed edamame and a pasta primavera with tomatoes, eggplant, onion and carrots. Yum! I found one of those spiders in my yard yesterday too. I've been told they're good, but yikes! Sounds like a plan. We'll have to find a day!